OK, I know it looks pretty strange and you might be thinking this garlic is moldy. But it’s not – this is actually delicious black garlic. So Just What Is Black Garlic Then? It’s actually normal white garlic aged by a special process. This is often mis-described as ‘fermentation’ – it isn’t really. It’s garlic aged over several weeks at a humid 140 to 170 degrees Fahrenheit. This causes the ‘Maillard reaction’ to take place – the same process that makes toast taste so good. The texture is soft and melting. The flavor is unique, subtle and almost caramel. It does not taste ‘burnt’. It really is quite special, and worth seeking out just to try it. You can eat it on it’s own, on bread or blended into a mayonnaise. It is a subtle flavor though so if added into food you either need to use a lot, or it needs to be quite mild tasting food for the caramel notes of the garlic to come through. It won’t add a garlic flavor, so is definitely not a substitute for white garlic. It’s not easy! So making it yourself is pretty hard and will take a lot of trial and error. Temperature and humidity need to be carefully controlled over a period of weeks. It can take over a month to achieve the right maturity. It’s also easy to get it wrong. If you overheat it, or heat it for too long you can ruin the taste and end up with burnt flavors. Too much humidity and the garlic can rot. 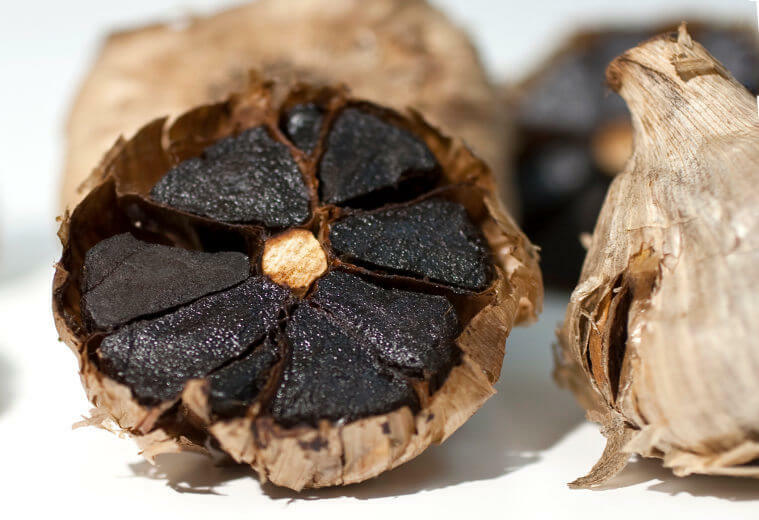 What Is Black Garlic Used For? Remember that black garlic is all about the subtle flavors. So use it where it won’t get overpowered. It blends well into oils or dressings. It’s great eaten simply — on it’s own, or spread on bread with a little oil. You can also cook with it too of course. It is good rubbed in to fish or even chicken. It also makes a great finish when sprinkled over a dish to add an extra depth of flavor. But it’s best to taste it raw and uncooked first to really understand the flavor you are using.